Last week, a team of scientists noted that thin, one-year ice has largely replaced older, thicker, multi-year ice in the Arctic. Arctic sea ice extent for January 2011 was the lowest in the satellite record for that month. In February, the LA Times reported that a female polar bear swam for nine days – nonstop — across the Beaufort Sea, before reaching an ice floe. The swim cost the bear 22 percent of her weight and her 1 year old cub. In April, the National Snow and Ice Data Center (NSIDC) reported that this winter’s maximum Arctic sea ice extent tied for the lowest on record. Summer analysis of sea ice in Hudson Bay showed that the Hudson Bay area had about 18% ice cover, compared with an average of 43% for that time of year. In July, a new study showed that melting sea ice in the Arctic is forcing polar bears to swim longer distances, causing many to lose their cubs. Last month, NSIDC announced that 2011 saw the second lowest Arctic ice levels since 1979 when satellite observations began. An online series from Nature this month points out that the Arctic is “warming roughly twice as fast as the rest of the globe” and facing a whole set of challenges from industrial development that it has never before experienced. Individually these reports are alarming, but taken together they paint a frightening picture of what is happening to polar bears and the place they call home. Take it a step further and look at the overall trends of the past 10 years, and the truth is undeniable: polar bears are on a pathway to extinction unless action is taken soon to curb warming trends. It remains to be seen how long the polar bears of Churchill will be forced to stay on land this year, but it could likely be another hard year for these bears. 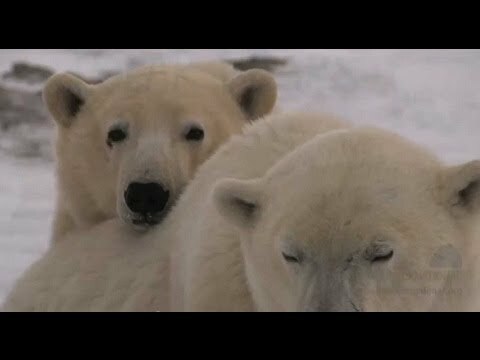 As the video points out, we still have time to change the path we are on and avert the worst case scenarios for polar bears, the Arctic and ultimately, our planet. Members of Congress are pushing for legislation that would put polar bears at greater risk by ripping apart Clean Air Act limits on global warming pollution, crippling crucial conservation programs, and speeding dangerous drilling off Alaska’s coast. Help protect polar bears by sending a message to your members of Congress, urging them to stop this unprecedented attack on wildlife.